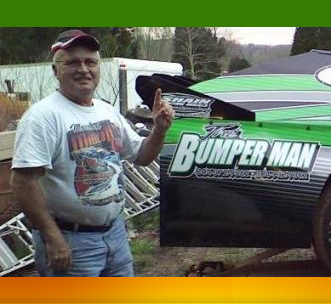 Welcome to The Bumper Man website featuring bumpers and accessories by the bumper man himself, Mike Richardson. He also has started selling Monte Carlo and Caprice Nose and Tail pieces(made by A & R Bodies, out of Greenbrier, Tn. ), Bendable Body Mounts, and Adjustable Spoiler Brackets. If you can give us the dimensions of your Modified Cars and tell him how you want them, he will build them to order. He also has Late Model Front Bumper Valances.